It all began when Tom visited South Africa in 1997 and saw a boy playing a home-made tin can guitar. He was shocked and saddened to discover there’s no music in the school curriculum, but was inspired by the love of music and untapped talent among people he met in the community. For individuals, it seemed a tragic waste of potential while the lack of live music more generally, struck him as a sad gap in peoples lives. So he set about raising funds with the support of loyal friends, many of them here in the Yeovil area, and Music for Africa was born. From just one teacher and 20 students in the early days, MfA now has five staff teaching over 140 students in 11 different locations across Limpopo and Cape Town. And although things have moved on in South Africa, there’s still no music education in many schools. We help young people learn mainly guitar and bass guitar, but also keyboards, drums and music recording skills. Students play classical, contemporary and their own traditional music. With each successful year, our work has grown. We’ve built three new classrooms, provided over 200 young people with guitars and trained three music teachers. 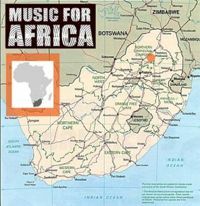 The Music for Africa project is based around the village of Phokwane in the Limpopo Province of South Africa, an area of mountanous scrub desert with mainly dirt tracks between villages. The villagers, many of whom live on less than £100 a year, derive their income from market trading, where they sell produce from more cultivated areas further north, government occupations in hospitals, police stations and clinics, and taxi driving. Some retail work is available in small supermarkets or by selling firewood or wood carvings at the side of the road. DECEMBER'97 Tom visits his friend Jill (who's in the middle of a 2-year Voluntary Service Overseas contract as a physiotherapist) at St Rita's Hospital near Glen Cowie in the Northern province. He meets Thelma, a little girl whose mother (one of Jill's patients) can't afford to send her to the local primary school. Tom offers to pay for her. Tom also meets Elsie Mohloko, a hospital security guard, with a burning ambition to work as a performing artist but on 30p an hour (and 2 children to support) can't afford the training. Tom teaches her to play a few Tracey Chapman songs (Tracey Chapman being her hero) and gives her a guitar to practice with when he leaves. MARCH '98 Tom revisits Jill, pays Thelma's schooling bill for the year - £1.50(!!) - and goes to visit her school. At Lehlake Primary in Phokwane, 900 pupils are being taught 70 to a class in sub-standard accommodation managed by headmaster, Elias Seloane, from a breezeblock hut with a leaking corrugated roof. The foundations for new school premises had been abandoned years ago. There are certainly no facilities for the teaching and learning of music here. Tom tells Elias he wants to do something to help the kids musically and Elias tells Tom about Matthew Matebane, his school caretaker, who is also an accomplished guitarist. Meanwhile, Elsie has been progressing with her guitar at such a rate that Tom suggests both Matthew and Elsie start teaching music: he says he'll find some way of providing the instruments and paying their wages. They each run an after-school music workshop once a week - while continuing with their day jobs.